The item is soon available. Questions? Please contact customer service. 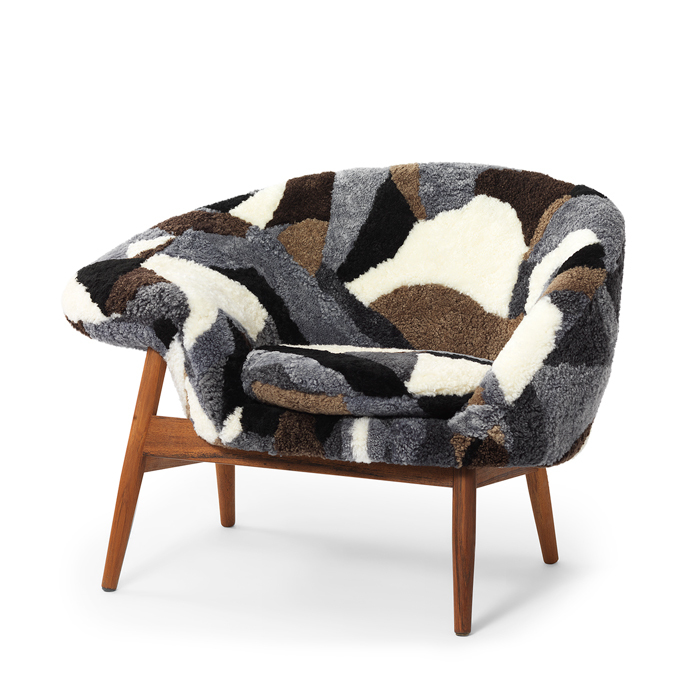 Unique asymmetrical armchair in a distinctive, faceted version with hand-stitched soft sheepskin, in which sheepskin remnants in various colours have been combined, making each stool a unique piece of furniture The Fried Egg armchair was designed by the highly acclaimed Danish architect, Hans Olsen in the 1950s. 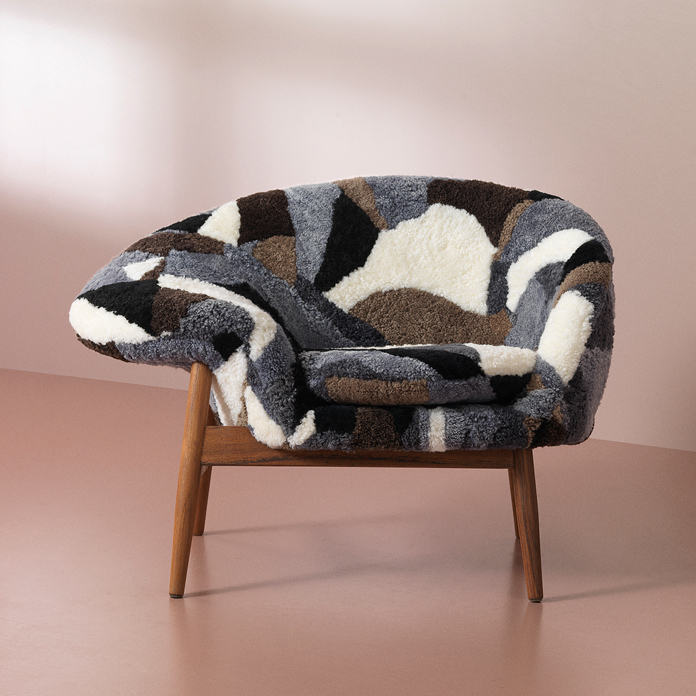 The personality and caprice that characterise this unique designer chair are emphasised in this extremely comfortable sheepskin version that is now available to design lovers. This roomy, comfortable chair was christened 'FRIED EGG', because that is what it looks like when viewed from above. The flat armrests invite you to swing your legs nonchalantly up on them, when you really feel like relaxing. The soft, naturally curly sheepskin upholstery is available in three versions, each with its own charm. There is a beautiful grey version with a dark, subdued expression. 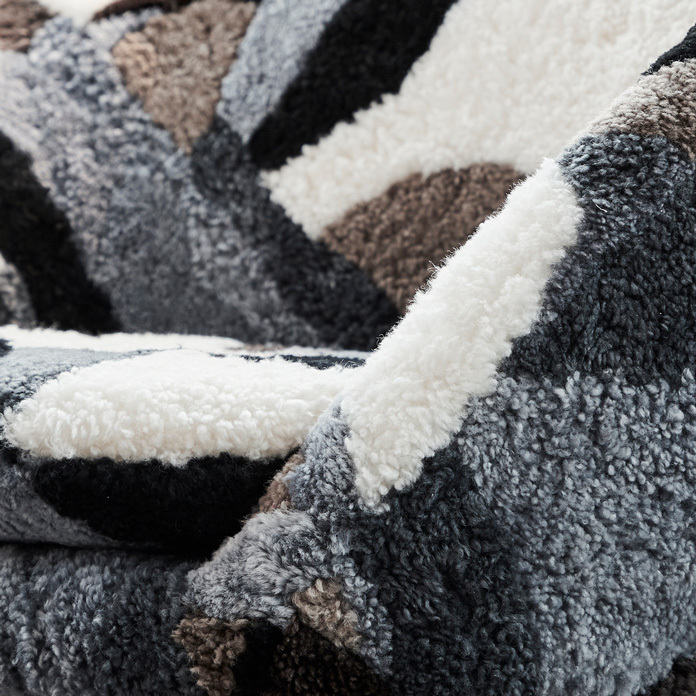 The bright version features lightness and elegance and a slightly stronger fleece. Finally a distinctive multi version. As a tribute to the 1950s' love of teak, Fried Egg is available in this elegant wood. 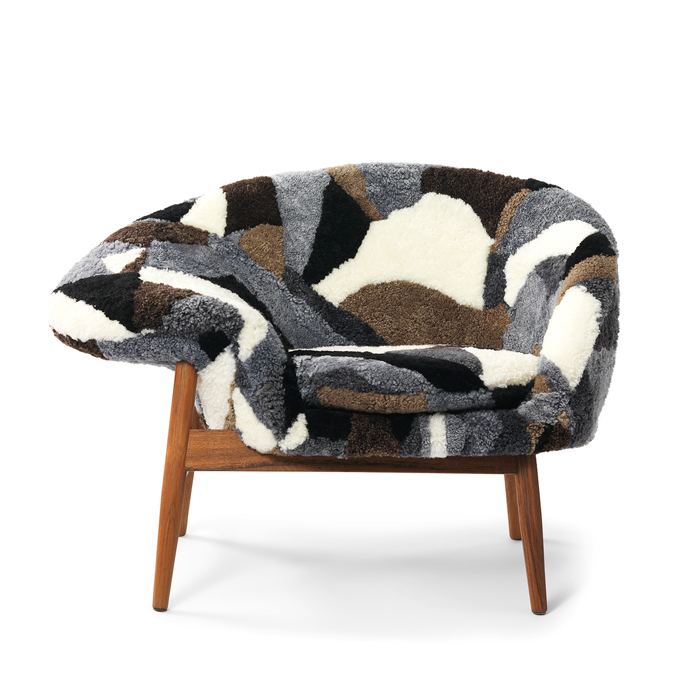 Choose from exclusive, self-coloured sheepskin in colours curated to reflect the Warm Nordic universe or the unique version in multi-coloured sheepskin, which varies in composition within a grey, brown, white and black colour palette, generally featuring all the colours. The frame is available in the highest quality teak. Hans Olsen’s remarkable designs from the 1950s are vivid examples of the beautiful diversity of Danish Modernism. This Danish architect and industrial designer took on the classic virtues of the Academy of Fine Arts and the great master, Kaare Klint, but opted for a more playful and experimental approach to furniture design. Hans Olsen challenged contemporary production methods and much of his inspiration came from the opportunities offered by moulding wood. A refusal to compromise in terms of comfort, functionality and aesthetics is Hans Olsen’s trademark, and his iconic design attracts just as much attention today as it did back then. After consultation with Hans Olsen’s family, Warm Nordic will uphold the design legacy of this great architect and will regularly launch more House of Hans Olsen uncompromising designs.